Create a tranquil space to create with the Amish Royal Mission Writing Desk with Pencil Drawer providing the perfect work space. This mission style office furniture is graceful, attractive and full of function. 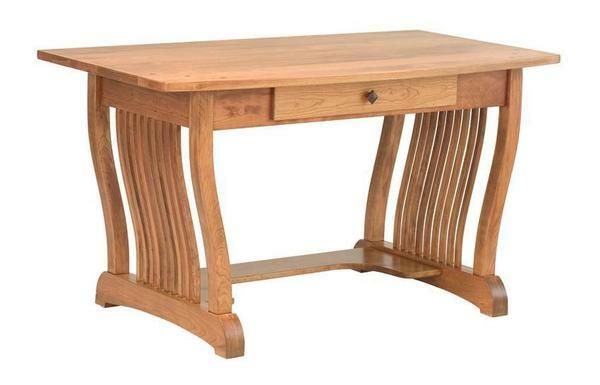 Putting a twist on traditional mission slatwork, the Royal Mission Writing Desk makes some waves within its design. Your choice of solid wood curves in on both sides, creating a beautiful shape. This 54" width provides room for your laptop and notepad and leaves filing to the credenzas and bookcases. The Royal Mission Writing Desk is shown here in cherry wood. Cherry wood furniture is beautiful and strong, developing a deep, rich patina over time. The 1" thick desk top curves gracefully and the construction is top notch. Handcrafted by the Amish, this is a writing desk that will be passed on for future generations to enjoy. Select the wood and stain you love and browse our collection of mission style furniture for other areas of your home.